Physician Assistant Clinics aims to provide an authoritative and continuously updated clinical information resource that covers all of the relevant PA specialties. Our clinical review articles address the key points, diagnosis, prognosis, clinical management, and complications of disease and techniques, evidence, and controversies in the field. Information for quick reference, as well as in-depth coverage of a topic, is a hallmark of the Clinics’ series. 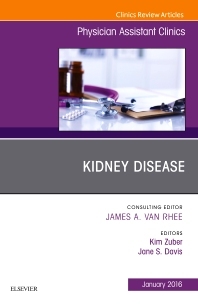 This issue of Physician assistant Clinics, guest edited by Kim Zuber, PA-C and Jane S. Davis, DNP, CRNP, brings together expert PAs, NPs, and MDs to give PAs deep insights into the latest advancements in renal disease and show how they are applicable in practice. Articles in this issue include: Will the Real Kidney Patient Please Stand Up? ; Introduction of the Kidney Patient; The Surgical Kidney Patient; CardioRenal: The Pump and the Filter; Dosing the Kidney Patient; ABCs of the ICU; Pediatrics: Forgotten Stepchild of Nephrology; Acute Kidney Injury (AKI); Outpatient Management of the CKD Patient; Nephrolithiasis: The Rolling Stones; Transplant and the New Protocols; Health Disparities in Kidney Disease; and Diet and the Kidney.